A Stereo Acoustic Echo Canceller (SAEC) is one example of multichannel acoustic echo cancellation operations where the channels are highly correlated. Stereo AEC devices are an important part of telecommunication systems where the end users are located in conference rooms or auditoria equipped with stereophonic and/or surround sound systems. Stereo teleconferencing systems provide much more realistic audio communication between conferees than monophonic systems. Spatial information provided by stereo channels reduces the listening effort and improves overall audio communication, provided the stereophonic and/or surround sound audio components help reduce echoes without introducing adverse audio side effects. Adaptive filtering methods for stereo AEC are largely similar to the ones of monophonic AEC. 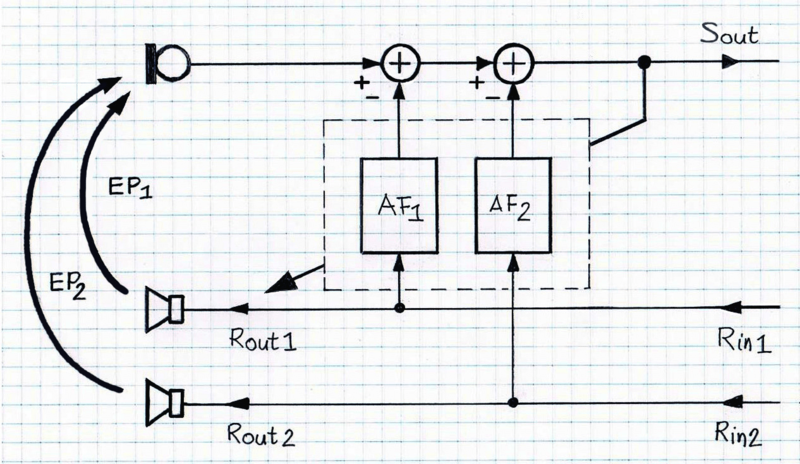 The key differences between stereo and mono AEC lay in the AEC system topology and the use of signal pre-processing functionalities. 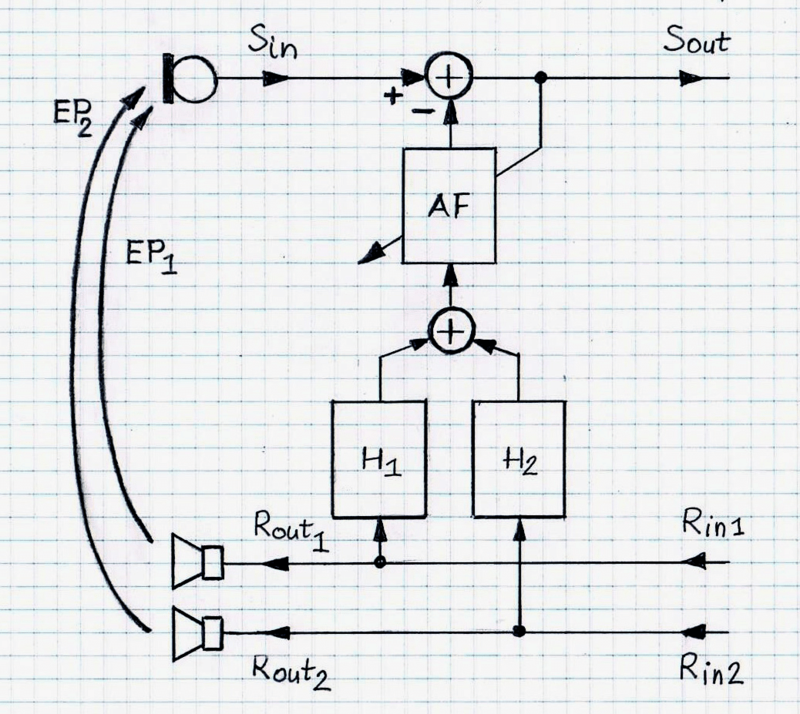 Without implementing proper system topologies and signal pre-processing, adaptive filters used in SAEC, when exposed to highly correlated input channels, result in no unique solution and have a tendency to diverge; consequently they result in degrading the audio quality beyond acceptable levels. Several alternate configurations of SAEC are here briefly discussed and accompanied with pros and cons of the individual approaches. Since the subject of stereo AEC has grown substantially as a separate topic of echo cancellation and the number of solutions available is considerable, the notes below serve only as an introductory primer to this important field of voice quality enhancement. Figure 1 depicts a fully stereophonic channel linking the near end and the far end with a full SAEC introduced at the near end only, for complexity-reduction purpose. The full SAEC is an acoustic echo canceller with four inputs (that is, with two reference signals and two microphone signals) at the near end and two outputs going upstream. Since in stereophonic communication the input signals y1 and y2 (i.e., Rin1 and Rin2) are correlated (and often highly correlated) then, unlike monophonic echo cancellation, a problem of non-uniqueness occurs. The problem manifests itself by generating adaptive filter coefficients that do not represent the true echo path impulse responses. There are several specific variants of the SAEC that concentrate on a somewhat simpler case, namely handling two reference signals and operating on one microphone signal. Figure 2 illustrates a version of the SAEC that works well for uncorrelated channels (Rout1 and Rout2). As soon as the channels become correlated (as it typically takes place in the stereophonic channels) the non-uniqueness problem occurs and the SAEC begins performing poorly. One method of addressing the poor performance is to de-correlate signals Rin1 and Rin2. Figure 3 depicts a SAEC structure that incorporates two blocks, NLF1 and NLF2, in the Rin1 and Rin2 directions. These two blocks are essentially nonlinear filters that, through injecting low-energy nonlinearities to signals Rin1 and Rin2, de-correlate them to the extent that the adaptive filters no longer behave poorly and manifest the non-uniqueness problem. In order to minimize audible effect of nonlinear distortions, in some SAEC solutions human hearing perceptual properties are included into designing blocks NLF1 and NLF2 so the far end users do not hear these nonlinear distortions. There are several other effective methods of de-correlating the input signals. They include techniques based on adding low-level random noise signals of specially pre-defined spectrum or adding time varying all-pass filters. Figure 4 depicts yet another approach to stereo AEC, namely, a method that takes advantage of the a priori knowledge of the near-end echo path. Filters H1 and H2 are static and their coefficients are pre-loaded with known values. 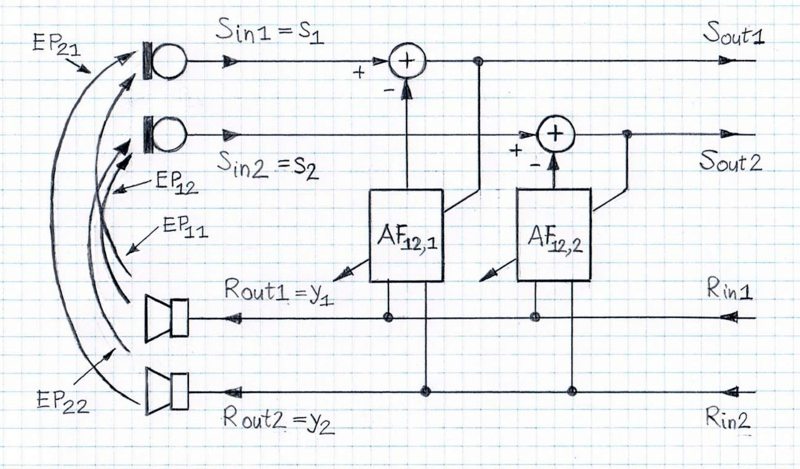 Adaptive filter AF works adequately provided the actual echo path impulse responses are well approximated by H1 and H2. VOCAL Technologies’ robust acoustic echo cancellation algorithms can be used as key components of stereo AEC solutions; the customer can choose one of the configurations of the SAEC that fits best to the specified use cases. Please contact us to discuss your stereo acoustic echo canceller application.